Gentry, A. W. 1978. Bovidae. Pages 540-572 in Evolution of African Mammals. V. J. Maglio and H. B. S. Cooke, eds. Harvard University Press, Cambridge. Gentry, A. W. 1990. Evolution and dispersal of African Bovidae. Pages 195-227 in Horns, Pronghorns, and Antlers. G. A. Bubenik and A. B. Bubenik, eds. Springer-Verlag, New York. Groves, C. P. 2000. Phylogenetic relationships within recent Antilopini (Bovidae). 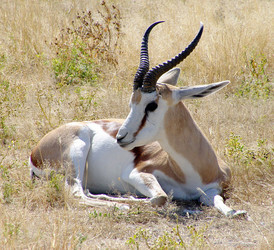 Pages 223-233 in Antelopes, Deer, and Relatives. E. S. Vrba and G. B. Schaller, eds. Yale University Press, New Haven. Kuznetsova, M. V. and M. V. Kholodova. 2002. Molecular support for the placement of Saiga and Procapra in Antilopinae (Artiodactyla, Bovidae). Journal of Mammalian Evolution 9:271–280. Rebholz, W. and E. Harley. 1999. Phylogenetic relationships in the bovid subfamily Antilopinae based on mitochondrial DNA sequences. Molecular Phylogenetics and Evolution 12:87-94. 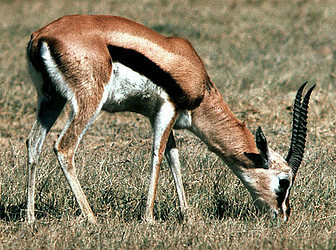 Thomson's gazelle is specialized to graze short grass, seeking the new shoots rich in water and protein. 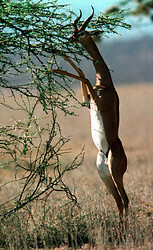 The gerenuk or giraffe antelope has a long neck and the ability to stand on its hind legs. It can thus reach nutritious acacia foliage up to 2m above the ground, at times when all other vegetation is dry and brown. Page: Tree of Life Antilopinae. The TEXT of this page is licensed under the Creative Commons Attribution-NonCommercial License - Version 3.0. Note that images and other media featured on this page are each governed by their own license, and they may or may not be available for reuse. Click on an image or a media link to access the media data window, which provides the relevant licensing information. For the general terms and conditions of ToL material reuse and redistribution, please see the Tree of Life Copyright Policies.